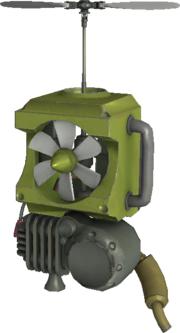 The Propellerpack is a backpack with a helicopter blade utilized by Baron K. Roolenstein to make him fly in Donkey Kong Country 3: Dixie Kong's Double Trouble!, Donkey Kong Land III, and Super Smash Bros. Ultimate. Its name is a pun on "propeller" and "backpack". The Propellerpack first appears in Donkey Kong Country 3: Dixie Kong's Double Trouble!. In this game, Baron K. Roolenstein wears the Propellerpack as a backpack and uses it to fly around the levels Kastle KAOS and Knautilus. In both levels, the player must specifically hit the Propellerpack with Barrels and Steel Kegs, respectively, in order to damage Baron K. Roolenstein. The Propellerpack reappears in Donkey Kong Land III where Baron K. Roolenstein uses the Propellerpack to fly in the levels K Rool Duel and K Rools Last Stand. The Propellerpack reappears in Super Smash Bros. Ultimate as King K. Rool's up special. When used the player equips the Propellerpack and flies upwards, where they can move horizontally. After a couple of seconds the Propelllerpack's blades slow down and the player falls back downwards. When this happens the player cannot dodge, attack, or jump until they touch the ground although they can still move horizontally. This page was last edited on February 18, 2019, at 10:27.